Setting:The fabled theme park of Poketopia! Plot:All was well in Poketopia.....until Team Atomic came. 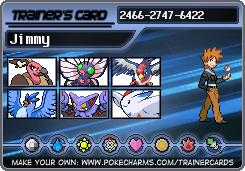 Team Atomic is a team of Poketopia trainers who always seem to lose against the challengers. They are bent on destroying Poketopia. The Colosseum leaders are at a loss for what to do, so 5 of their younger/older relations take charge. The grunts in Team Atomic use Fire and Psychic PKMN, The chief executives (Ana, Tony, and Michael) Use Water, Grass and Normal, and their boss, Tallia, uses Steel, Dark and Ghost PKMN. Over the course of the adventure, the guys go to the 10 Colosseums to defeat the threat to Poketopia! 2.You can only have 1 BASIC PKMN (to start with, at Lv 5. You can evolve it later.)! No legendaries, if you want one, they'll come later. 3.Your PKMN can have 1 TM move that it's compatible with....no Eevees with Focus Punch or something. 4.Once you get more PKMN (again, later) at least 2 of them, if not more, must be of the same type. 5.Only 5 people to enter, please. If you're wondering why, look at the plot. 6.First come, first served. Don't hold back, this is my 1st RP and I want it going for a little bit at least. 7.Please, please, please don't break the rules. I really don't want to have to ban you, although I very highly doubt that'll happen. 8.You must be somehow related to one of the Leaders. 9.Only one person can be related to the chosen Leader. Joe, The tuxedo-clad leader of the Gateway Colosseum. Taylor, The sweet little girl dressed in a Pachirisu-outfit, leader of Main Street Colosseum. Marina, The young girl dressed as a Kyogre, leader of Waterfall Colosseum. Voldon, The strong man dressed as an Electivire, leader of Crystal Colosseum. Sashay, The graceful dancer and the Leader of Sunny Park Colosseum. Terrel, The guy fitted up with a Groudon outfit, the Leader of Magma Colosseum. Dusty, The cool boy dressed as a Lucario and the Leader of the Sunset Colosseum. Kruger, Another tuxedo-clad guy (a bit more chunky than Joe though.). This white-tuxedoed guy is the Leader of Courtyard Colosseum. Mysterial, The Master of Poketopia and a magician. He is the Leader of Stargazer Colosseum. Personality: Like Kruger, Konnor was brought up to be smooth, sophisticated, and polite. He is also slightly arrogant and adores battling. He has a leader's love for battling but can be a little hot-headed. He despises his brother because Kruger always looks down on him and under-estimates him. History: He and his brother own the Mansion in Courtyard Colosseum. Kruger often bosses him around and forbids him to go into the Colosseum. Konnor's life has been like this for 15 years. He has lived in Poketopia for all his life. Other info about your character/their PKMN: Myth is constantly wrapped around Konnor's shoulders and both of them mean the world to each other. Last edited by *superiorchingling* on Thu Jun 26, 2008 9:17 am, edited 2 times in total. Personality: Although Mysterial's cousin, Brendan shows no interest in magic. He never tends to be with Mysterial and is slightly creeped out by Mysterial's appearance and personality. Brendan is very quiet and shy, and absolutely loves Pokemon. He tends to sometimes trip over what he is saying and, on occaisons, can be very blunt. History: Brendan usually lives with his parents, but came to visit his aunt and uncle, who live with Mysterial in Poketopia. Other info about your character/their PKMN: Bellsprout tends to come out of her Poke Ball on her own accord. She is very obedient to Brendan. They both share a close bond. Personality: Ever the realistic one, Isaac normally tries to lead rather than follow. He'll stop at nothing to ensure the safety of he and his team while overcoming the mission obstacle. However, if someone deserves to be put in their place, he'll not refrain from it. He refuses to give up, even in the tightest of situations. History: Isaac has always been known by his sister, revolted by this, he moved off to a far off nation to create his own organization and become known for his own skills rather than his sister's. Only after hearing about Team Atomic did he return to join and battle against them. Other info about your character/their PKMN: Although Isaac preffers to use Spinarak often, he's fairly new to the team and they're still growing closer. Personality: Generally hopeful, but when depressed, becomes very pessimistic, harsh, mean and untalkative. History: Zaffer and Dusty were orphans together, and through earlier years, Dusty protected Zaffer from the harshness of reality. Dusty ended up realizing that his connection to his Fighting pokemon, Riolu, was so great that he might pursue it as a career. Needless to say, Riolu evolved and, being Dusty's favorite out of his Fighting-type set, he dresses up as him for the effect it has on challengers - awe. Zaffer lives in Sunset Colosseum with his brother and, aspiring to pokemon as well, learns from his brother's example and loves him as much as a brother can. Dusty is also protective towards Zaffer, so when Zaffer decided he would join the force against Team Atomic, Dusty was very worried and tried all forms of persuasion to stop Zaffer from joining. Unfortunately for Dusty, Zaffer had made up his mind long before. Because of his joining, there now lies a sort of rift between the brothers that has not yet been overcome. Other info about your character/their PKMN: Both Sanders and Zaffer share two likes - water and nighttime. Zaffer swims very well, and while Sanders can't swim due to his innate weaknesses, he'll still play in the water every chance he can get. They also both love darkness, but not in an evil way whatsoever. They both have well trained night vision, almost as good as a cat's. Welcome to my 1st ever Rp, hope you enjoys it! Zapheres!! Your PKMN has an egg move?? <SHOCK HORROR> no worries, it's cool. Welcome St Jimmy and Blaziking175! Have fun. If you don't want a mod to come in and wreck this, you should probably apply there first. Zapheres, I owe you. Thanks. Carry on posting! So when's this show getting on the road, eh? Someone's already related to Dusty....soz i'll put that in the rules. Could you possibly fudge in another member? Personality: DX is quiet and serious at first, but can be enjoyable when he opens up. History: Wanted to be a professional swimmer, but a severly injured leg prevented this from happening. However, during the incident where the injury occured, a Goldeen rescued him. Goldeen joined him, and he went after his new dream: becoming a Pokemon trainer. Other info about your character/their PKMN: Goldeen, despite all of DX's pleading, is a vegitarian. can seven work out? if not is it okay if i comment? Appearance: loves the color purple and uses it oddly- he wears a purple tuxedo, gloves,shoes, and hat. the jacket is untucked in the back. his hair is (suprise suprise!) purple. somehow, he managed to get purple eys without contacts, but don't ask. his hair is spiky like the classic manga hero's. Personality: easygoing and laid back, the only time he really gets mad is when he loses. although he put's on atough act, he is terrified of his father (who's constant magic apparantly scarred him psychologically). he loves the mind, viewing it as a work of art done by a master. he never seems to have fully grasped proper grammer, although he is quite smart. History: at a young age his father trained him in the ways of a colloseum leader, earning rosho's loathing. when he was four, his friend was mauled by a rogue tyrantitar that had come down from a nearby mountain, looking for poachers who captured it's baby, and this totally wiped out his knowledge of english (i don't know if this is possible or not, but i'm assuming it is). Other info about your character/their PKMN: the ralts is shiny. his dad gave him the egg as a second birthday present and voilia! shiny. for some reason, he firmly believes that being shiny makes a pokemon uber. he is also good friends with mysterial, from which he inharited his love of psychic pokemon. Last edited by rumetz on Sun Jul 06, 2008 1:06 pm, edited 2 times in total. Sorry, you'll have to be related to someone else. I Promise we'll start after this. No more to join, please!! oh oops sorry. he loves tuxedos so he's joe's son i guess. Konnor looked out at the courtyard and sighed. He'd always wanted to walk around in the moonlight, but Kruger forbade him. He really hated his brother sometimes. "You going out their?" asked Kruger challengingly. "Yes, actually!" replied Konnor, and leapt out of the window. No sooner than he landed on the floor, poised like a panther, there was a "ping!" as the concealed lift to the courtyard opened and revealed a fuming Kruger. "How many times do I have to tell you NOT to go out here?!" bellowed Kruger, grabbing onto Konnor. But Myth, Konnor's treasured Dratini, jumped onto Kruger as Konnor yelled:"Thunder Wave!" DX watched as two trainers battled in the Crystal Colluseum, where his cousin was the leader. Volton walked up behind him. "Any predictions on who'll make it?" DX said, smiling at him. "Out of the four who are left...I'd say that girl who's battling right now. See how her Pidgeotto and Butterfree do that gust/silver wind combo? That should land her at least in the top 2, and I'm pretty sure she'll get to battle me," Volton said. As he finished talking, the girl managed to win. Isaac was on his way back to Neon Colloseum as a large group of people rushed to him. "Oh my gosh, aren'y you Rosie's older brother?? Can you get me her autograph?" He heard these questions all the time and just sighed and walked away. stupid people... He was cut off by a man and woman with a camera and mic. "Excuse me! You are the elder brother of the infamous Rosie, of the Neon Colloseum, right?" "...Go away..." Isaac walked around them and coldly stepped off making his way closer before they caught up. "Please, just give us an interview--"
"Don't make me use my pokemon..."
Isaac gave them a cold look before entering the colloseum and making his way to the arena. "The winner: Rosie!!!" There were two people in it; A boy who looks like he'd just suffered defeat and a girl cheering that she'd won. Isaac sighed. "Here we go..."
"Isaac, is that you? I've missed you!" A young girl with a large smile ran up and hugged him tightly. "Hey Rosie...missed you too." They parted and she lookeda t him knowingly. "You hungryyyyy?" Isaac's stomache growled and he put his hand over it. "Thought so!" She grabbed his hand and pulled him off to a local eatery as he sighed silently. "So Rosie...what did you call me out for? I've been very busy with Kaos and---"
"It's a secret...I'll let you in on it when we get back." "Okay..." Isaac blew it off as something simple and carelessly went back to his lunch. DX looked up at Volton. The boy he predicted would go through won the finals, giving him the chance to battle him. "Before you go," DX said as his cousin began to walk to the elevator that would take him to the arena. "Why did you call me here?" Volton shook his head, frowning. "I'll tell you after this battle." rosho stared out at his father strolling elegantly out the door alongside his new espeon, then glanced up at the stars. normally they were hidden by the vast expanses of clouds, but tonight was different. a band brilliant specks danced around a new, brighter star. and was it just his imagination or was it getting brighter? a roar made him look down and scream. a new challenger had entered the gateway colloseum, a tyranitar stomping it's way toward his father.
" scared," he could feel his voice trembling "scared it bad." zobo sidled up to him and hugged his legs. it's horns were drooping lower than usually, a sign it shared his dellima. now some questions- how is beating all ten collaseums going to stop team atomic? how is battling going to work? it's not like we can all just say- go, ____________ use ___________! it's a critical hit! i win! How abouts this-if we travel to 4 Colosseums because there are 4 main bad guys (1st post) and lets say they took over the Colosseums and we have to battle them. It depends. To decide post your opinions. anyway, roleplaying time! (warning-exxcessive use of smileys ahead. after thinking it through, rosho decided to visit Mysterial. He could talk about the days events with him and train. he was three steps from the door when a hand reached out and grabbed the back of his jacket.
" And," drawled his father. "just where the hell are you going? you should be resting." Rosho hated it when he did this. pretending to care about him and Zobo when he just wanted to enforce his rules..
he yanked the hand away. "Out. watch world. converse." the espeon hissed and flicked it's tail in every direction.
" no you're not." joe's grin was sickening, like something the persian had dragged in as a "gift" for his master. "you never know what kind of sleazebags might be-"
rosho bolted. it was a stupid decision, yet it worked, in it's own right. "Zobo..." he called, but it was unessesary. the little ralts was already absorbing psychic power. joe, having predicted itself wasted no time. " psychic!" he called, seconds before Rosho matched it with "psybeam!" the blasts hit, and rocked the room. unfortunantly, this power came not from the force of the attacks resisting, but from the espeons attack slamming zobo into the wall. the ralts. stood up feebly, then collapsed. "Hammer arm!" said a voice from the other side of the room, followed by a crunch. 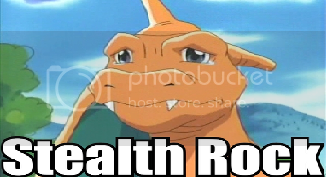 Rosho stared at the woman joining the tyranitar. she stood about 5 foot 8, with long, silver and black hair. "hello! the names thalia! " she stuck out her hand cheerily. "and your Rosho, joe's son and worst enemy. i have a little proposal for you!" Is this it: Say I was battling against a random Team Atomic Member, then if the designated controller of battles, was, say, St_Jimmy, then would he be narrating my battle? Or what?? yeah, something along those lines. just a thought.